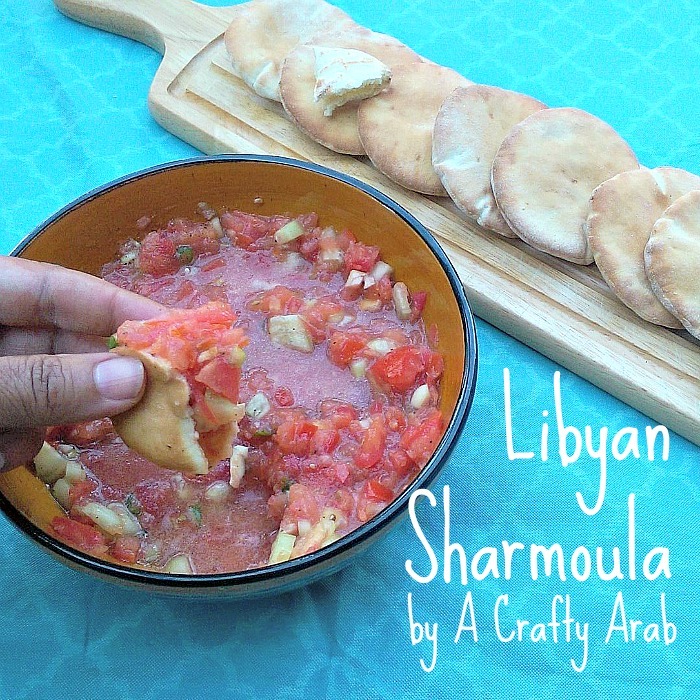 We are taking the day off here on A Crafty Arab because we blogged a post about Libyan Sharmoula over at Maroc Mama! Come on over and check out our Libyan Sharmoula recipe as part of Maroc Mama’s Digging into the Islamic World this Ramadan series. 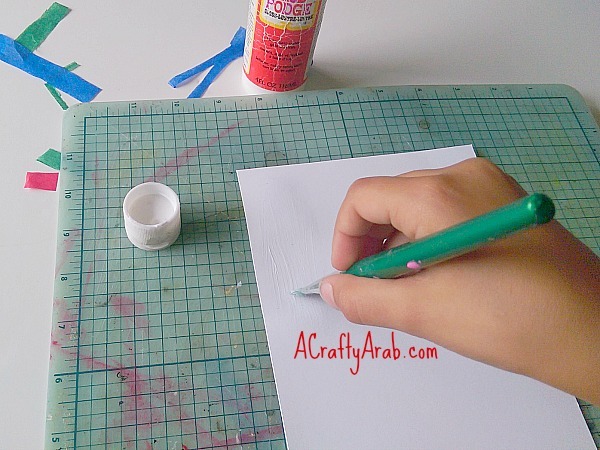 Be sure to head over to ACraftyArab on Pinterest to see more Arab food recipes. In this day and age of texting and apps, we sometimes forget to leave notes to each other the old fashioned way. 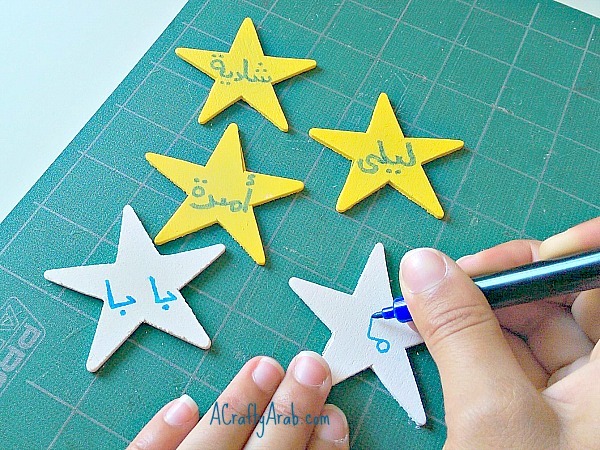 Today as part of the 30 Day Ramadan Crafty Challenge, we put together these starry memo magnet holders for the fridge. 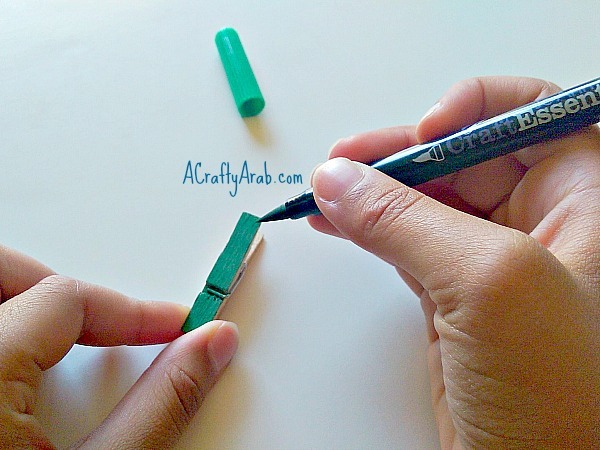 Use your marker to color your clothespin. We did this to the three smaller ones for the kids. 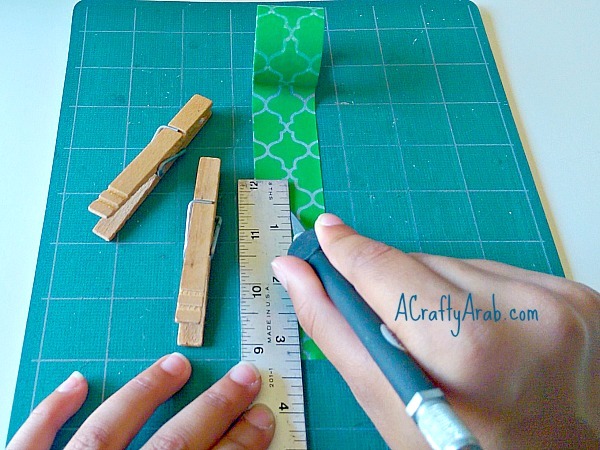 Place the decorative tape on your cutting mat and cut out the size you need to cover your adult clothespins. Write the names with marker of each family member on the stars. 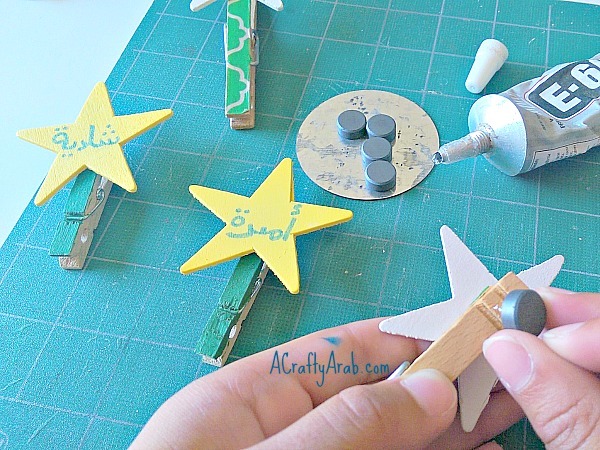 Put a dap of E-6000 on the clothespin and add the star name to the front of your clothespin. Turn your star over and add a magnet to each back side with the E-6000. 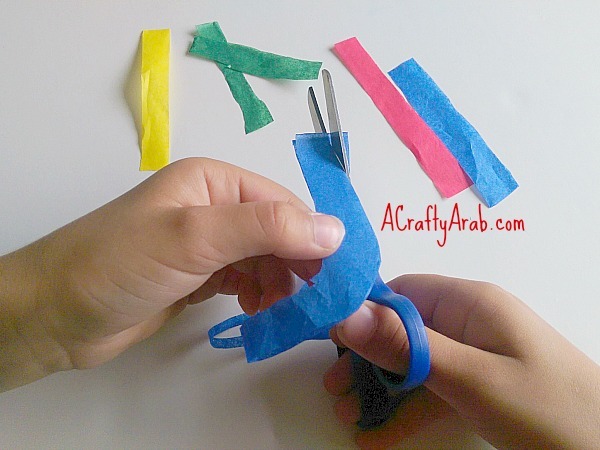 Or stop by A Crafty Arab on Pinterest to see more fun tutorials. 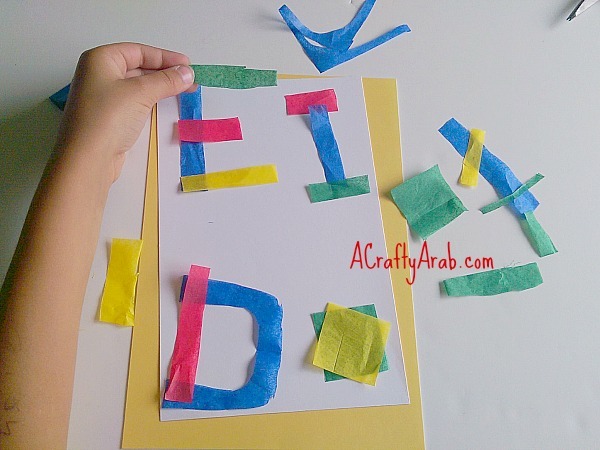 We love to use tissue paper as a medium for our crafts because it is so inexpensive. In fact I got the package that we used today from the thrift store for a few dollars and it will last us the rest of the year. We have used it on Star and Mosque Banners, Making a Soos, a Crescent Moon Puff Disc, Paper Lanterns and most recently our Allah Framed Art. 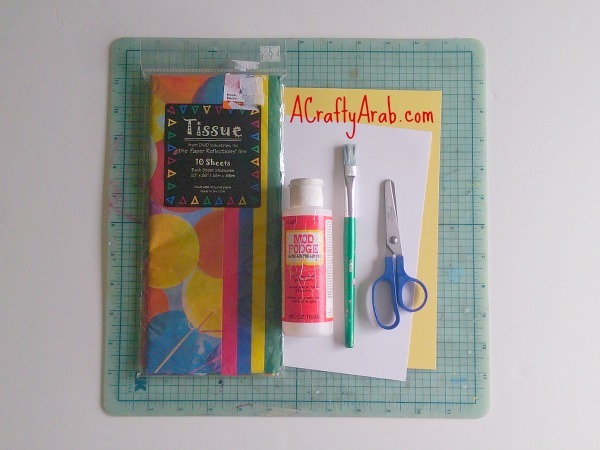 There are another half dozens tissue paper crafts on Pinterest also. 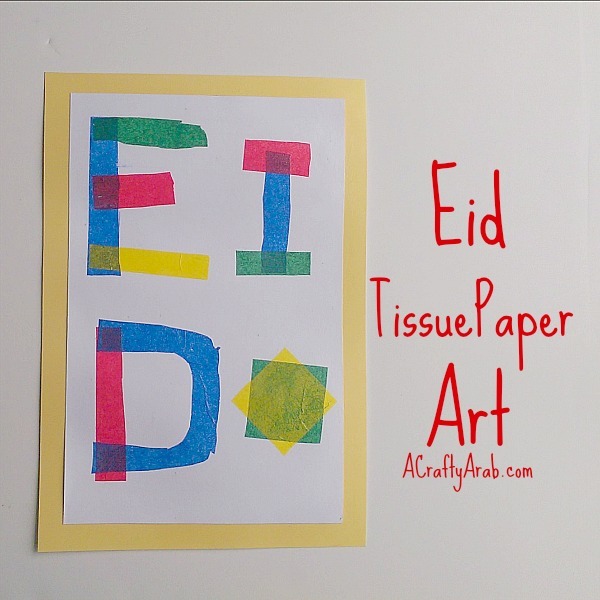 Today as part of our 30 Day Ramadan Crafts Challenge we used tissue paper again to create Eid Art. Cut various sizes of stripes from different colored paper. For the letter D, we folded a piece over and cut half of a U shape. We also cut two 1 1/2 inch squares for out Khatam 8 pointed star. Play around with your paper until you get a design you like. 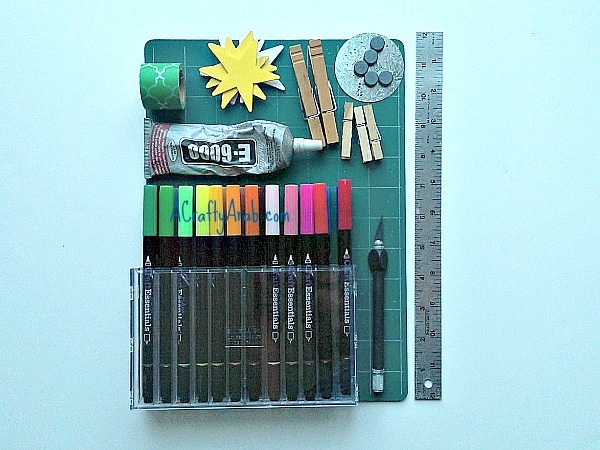 When you are happy with the design, layer a thin coat of Mod Podge on your white cardstock. It’s always best to do this over a plastic mat. 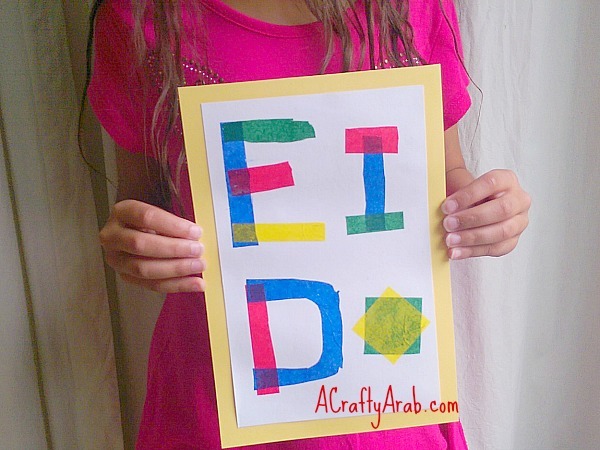 Lay your colored paper over and add another thin layer of Mod Podge. Keep adding and layering your cut tissue. 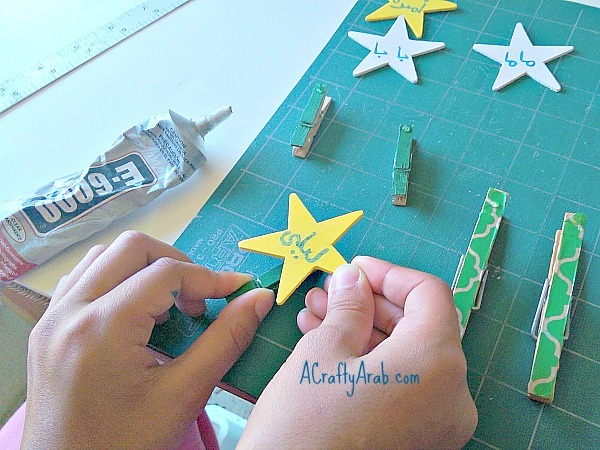 Layer your two cut squares over each other for the Khatam star. 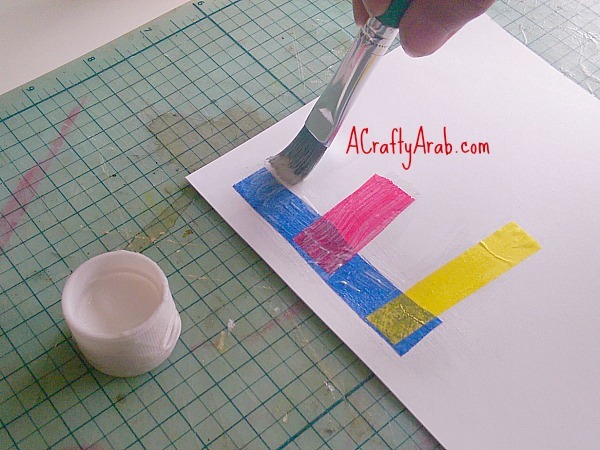 Add a thin layer on the yellow cardstock. 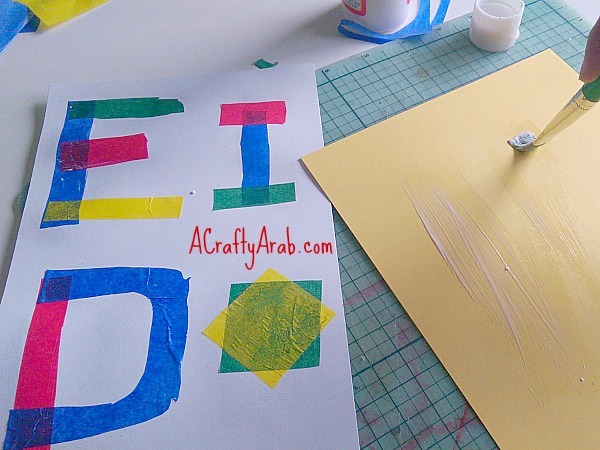 Evenly place your white cardstock over your yellow and add a final thin layer over the entire masterpiece. 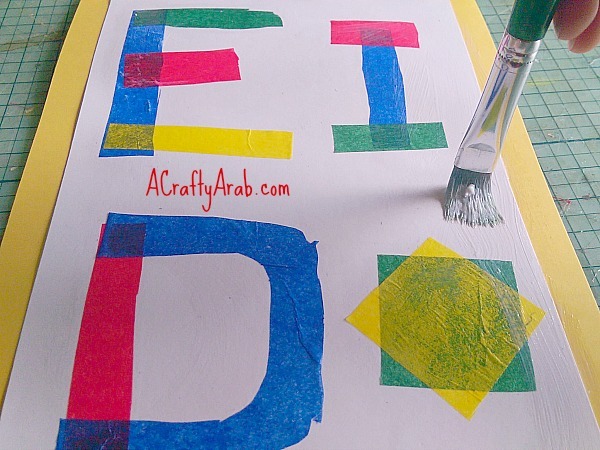 Be sure to visit A Crafty Arab on Pinterst to see more Ramadan crafts.